The Cubs and Emilio Bonifacio are in agreement on a minor league contract, tweets Gordon Wittenmyer of the Chicago Sun-Times. The 30-year-old switch-hitter was recently designated for assignment and released by the White Sox, with whom he had signed a one-year, $4MM contract this winter. Bonifacio struggled greatly with the White Sox in 2015, hitting just .167/.198/.192 in at plate appearances and missing time on the disabled list due to a left oblique strain. 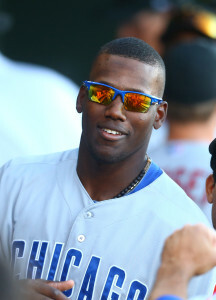 By signing with the Cubs, he’ll return to the team with which he’s had the most recent success in his career. Bonifacio spent most of the 2014 season with the Cubs and batted .279/.318/.373 with a pair of homers and 14 steals. Bonifacio has been inconsistent throughout his career, but the overall result of his efforts in the Majors is a .259/.316/.337 batting line with 13 homers and 165 stolen bases (in 213 attempts). Bonifacio’s speed is his greatest asset, and that could come in play for the Cubs in September, when he could potentially serve as a late-inning pinch-running option. Bonifacio stole at least 26 bases each season from 2011-14, including 30 steals in just 64 games back in 2012. Never hurts to have a little speed and position depth. Yeah and I bet if anybody except the Cubs would have signed him you would be saying how dumb they were and how washed up he is.. Pretty low cost/risk option from the Cub’s perspective. I like this move, and agree ,never hurts to get a speed guy. I think hey come into this great group of guys and contribute greatly. We now have both James Russell and Emilio Bonifacio back, so we essentially got a single A catcher from the Braves for nothing.